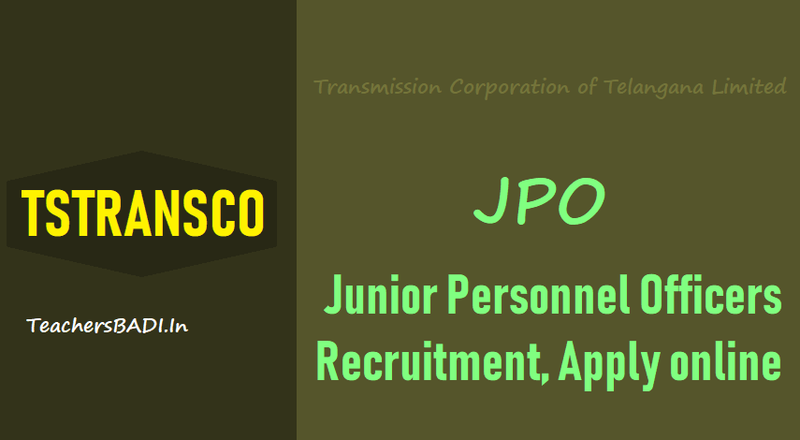 TSTRANSCO / Transmission Corporation of Telangana Limited Junior Personnel Officers(JPO) Recruitment/TSTRANSCO Transmission Corporation of Telangana Limited JPO Recruitment Online application form/TSTRANSCO Transmission Corporation of Telangana Limited Recruitment 2018/TSTRANSCO Transmission Corporation of Telangana Limited JPOs recruitment 2018, Results Merit List/ TSTRANSCO Transmission Corporation of Telangana Limited JPO Recruitment Hall tickets, Results 2018/ TSTRANSCO Transmission Corporation of Telangana Limited JPO Recruitment Results 2018 TSTRANSCO Transmission Corporation of Telangana Limited Junior Personnel Officers(JPO) Recruitment Selection list Results 2018: TSTRANSCO Transmission Corporation of Telangana Limited has releaseed the Junior Personnel Officers(JPO) Recruitment 2018 Notification and TSTRANSCO Transmission Corporation of Telangana Limited invites the #onlineapplications from the eligible and qualified candidates for the post of Junior Personnel Officers(JPO). 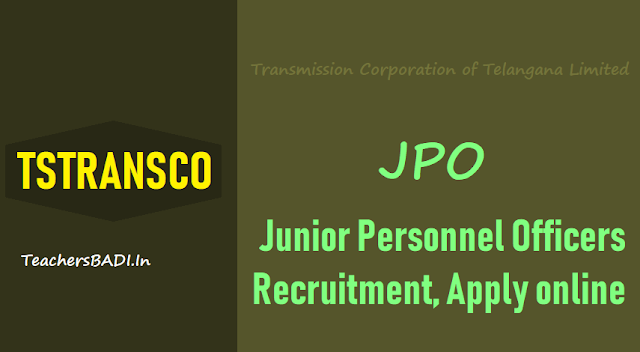 TSTRANSCO JPO Junior Personnel Officers Certificates verification dates 2018: Certificates verification will be held on November 9 for Candidates, those who were passed the examination of JAO, JPO Recruitment and certification verification will be held on July 9, from 10 am for JAO Candidates and from 2 PM for JPO Candidates at Vidyut South. Officials have requested to take two Xerox set copies with attested by Gazeetted Officer and along with age certificate, Academic original certificates. TSTRANSCO Recruitment for 62 Junior Personnel Officer Vacancy : Transmission Corporation of Telangana Limited (TSTRANSCO) has issued a latest notification for the recruitment of 62 posts. The post name is Junior Personnel Officer. If you want to make career at TSTRANSCO Vacancy then you can apply online application from 27 August 2018 to 11 September 2018. It is golden opportunity for interested candidates, who are seeking government job in TSTRANSCO Vacancy. Further other details are given below. Post Name: Junior Personnel Officer. Last date: 11 September 2018. How to apply: Online at http://tstransco.cgg.gov.in/. Junior Personnel Officer: The candidate should possess the following qualifications as on 01.10.2018.
and approved by the Government of Telangana. N.B. Mere securing minimum qualifying marks does not vest any right to a candidate for selection to the post of Junior Personnel Officer. The said preferences are only indicative for being considered to the extent possible but no binding. Therefore, the TSTRANSCO Transmission Corporation of Telangana Limited has the power to assign a successful candidate to any notified post in the zone in respect of non-local candidates, for which, he/ she is considered to be qualified and eligible, subject to fulfilling the selection criteria. Mere claim of preference for any zone for allotment against vacancy does not confer any right to selection for that Zone in particular or any Zone in general. The candidate has to apply online through APPLY ON LINE link at http://tstransco.cgg.gov.in/ or directly through TSTRANSCO website http://tstransco.cgg.gov.in/ link after carefully going through the instructions mentioned therein.